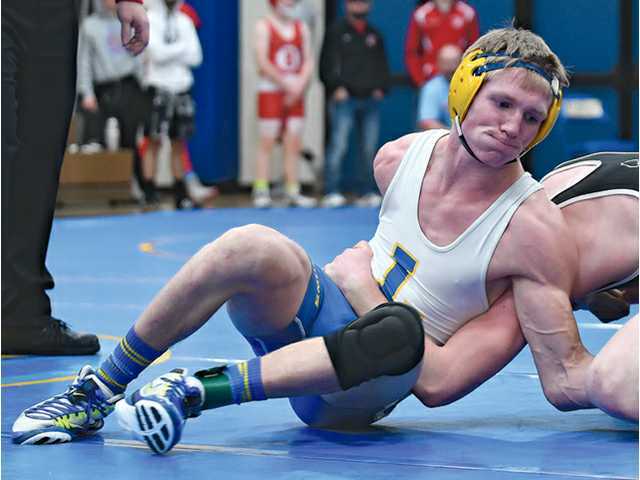 POSTED January 10, 2019 10:50 a.m.
Against visiting Belmont/Platteville, coach Brad Sturmer’s squad scored 63 points on four pins, four forfeits, two decisions, one major decision and one technical fall, while giving up just nine points on one pin and one decision. Picking up pins for the Arrows were: 113-pound sophomore Carter Lull (:25), 145-pound junior Logan Schneider (3:44), 152-pound senior Collin Lull (:37) and 160-pound senior Owen Wolf (2:09), while 120-pound senior Caleb Lucey earned a technical fall, and 138-pound sophomore Isaac Oyen a major decision. At Saturday’s Lancaster Invitational, the Flying Arrows scored 241.5 team points to finish first, and 60 points ahead of the second-place team from Sparta. Coach Sturmer’s squad crowned four individual champions, one runner-up and two third-place finishers. Coming away with individual titles were: 106-pound sophomore Remington Bontreger, who is now 23-1 on the season; 113-pound sophomore Carter Lull, who is now 21-5; 182-pound senior Troy Klein, who is 23-5 on the season; and 195-pound junior Caden Straka, who improved to 25-4 on the year. Second-place honors were picked up by 132-pound junior Matthew Crosby (17-8), while 220-pound senior Cole Zenz (24-4) and heavyweight Ben Withey (16-9) each finished third. According to the latest rankings on wiwrestling.com, the Flying Arrows are sixth in the division 3 field, with Stratford No. 1 and Fennimore No. 3. Individually, Bontreger is ranked No. 1 at 106 pounds, Carter Lull ninth at 113, Collin Lull 10th at 152, Troy Klein fourth at 182, Straka eighth at 195 pounds and Cole Zenz seventh at 220. River Ridge/Cassville also participated in Saturday’s invite, where they finished 12th as a team with 36 points. Heading the list for the Timberwolves was 195-pound junior Blake Laufenberg, who placed third and is currently 8-6 on the season. At 182 pounds, sophomore Gavin Esser placed fourth and is now 3-4 on the season. 106 - Remington Bontreger (L) received a forfeit. 113 - Carter Lull (L) pinned Tristen Gilbertson, :25. 120 - Caleb Lucey (L) won by technical fall over John Burbach, 3:03. 126 - Dustin Tydrich (L) def. Dylan Taber, 4-0. 132 - Matthew Crosby (L) def. Tanner Paulson, 5-0. 138 - Isaac Oyen (L) won by major decision over Brady Johnston, 16-4. 145 - Logan Schneider (L) pinned Payton Nielsen, 3:44. 152 - Collin Lull (L) pinned Trevor Heim :37. 160 - Owen Wolf (L) pinned Shannon Gill-Mast, 2:09. 170 - Morgan Seippel (L) received a forfeit. 182 - Troy Klein (L) received a forfeit. 195 - Will Schaefer (B/P) pinned Caden Straka, 5:38. 220 - Cole Zenz (L) received a forfeit. 285 - Michael Douglas (B/P) def. Ben Withey, 7-3. Team scores - 1. Lancaster 241.5; 2. Sparta 181.5; 3. West Salem/Bangor 160.5; 4. Darlington/Black Hawk 153; 5. Monticello 147.5; 6. Iowa-Grant/Highland 143; 7. Dubuque Senior 121; 8. Cuba City/Southwestern/Benton 106; 9. Dubuque Wahlert 101; 10. Boscobel 79; 11. Brodhead 48; 12. River Ridge/Cassville 36. 106 - Remington Bontreger (23-1) placed 1st and scored 30.0 team points. 113 - Carter Lull (21-5) placed 1st and scored 28.5 team points. 120 - Caleb Lucey (16-8) placed 4th and scored 15.0 team points. 126 - Dustin Tydrich (6-3) placed 5th and scored 9.0 team points. 132 - Matthew Crosby (17-8) placed 2nd and scored 21.0 team points. 138 - Isaac Oyen (15-8) placed 5th and scored 11.0 team points. 138 - Dylan Tydrich (3-2) placed 6th. 145 - Logan Schneider (12-10) placed 4th and scored 13.0 team points. 152 - Collin Lull (10-5) place is unknown and scored 0.0 team points. 152 - Clay McCartney (7-9) placed 5th. 160 - Owen Wolf (10-10) placed 6th and scored 13.0 team points. 170 - Morgan Seippel (13-11) place is unknown and scored 3.0 team points. 182 - Troy Klein (23-5) placed 1st and scored 30.0 team points. 195 - Caden Straka (25-4) placed 1st and scored 30.0 team points. 220 - Joey Recker (0-2) place is unknown. 220 - Cole Zenz (24-4) placed 3rd and scored 19.0 team points. 285 - Ben Withey (16-9) placed 3rd and scored 19.0 team points. 3rd Place Match - Ben Withey (Lancaster) 16-9 won by fall over Wade Picray (Monticello) 8-3 (Fall 1:37).